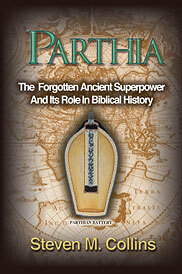 PARTHIA The Forgotten Ancient Superpower and it's Role in Biblical History. PARTHIA The Forgotten Ancient Superpower... and it's Role in Biblical History. Although little-known to modern readers the ancient kingdom of Parthia played a key role in historical and Biblical events. In this book exciting new research is presented proving a Semitic-Israelite connection and even a link to King David within the Parthian royal family. The names of Israelite tribes and clans are in evidence and Parthia's first capital city was named after ? "Isaac." Another surprise: the cover of the book shows a cutaway diagram of an ancient Parthian direct current battery. A number of these batteries have been found and this book documents the sensational discovery of electricity and examines its possible ancient uses. Some of the events of Jesus Christ's life become more understandable when they are examined in light of the politics that prevailed between Rome and Parthia at that time. One group of Parthian elites that chose Parthia's emperors was called the "Magi" or "Wise Men." A delegation of these high Parthian officials worshiped the young Jesus. This exciting story is told with the aid of over 100 maps charts and illustrations. Very well researched by historian and writer Steven M. Collins with 16 pages of appendices. This is truly a book you will find hard to put down.